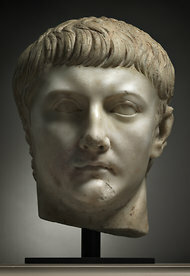 The Cleveland Museum’s new portrait of Drusus Minor has no ironclad record pre-1970. And so when two rare opportunities came Cleveland’s way  a stunning marble portrait from around the time of Christ thought to be that of Drusus Minor, son of the Roman emperor Tiberius, one of only about 30 such Drusus portraits known to have survived from antiquity; and a beautifully preserved Mayan cylinder vessel with a painted battle scene from A.D. 600-900  the museum did not pass them up. The marble head, in particular, for which Mr. Franklin said the museum paid a significant amount of its yearly acquisition budget, is likely to raise questions. It was sold at auction in 2004 in France and has no publication record before 1970. But the museum said it believed its history could be traced back to the late 19th century as the property of a prominent family in Algiers.